We are here providing you the information about the team and the information relating to the true prediction of the Bangladesh Premier League all matches but before you take the prediction to take a look on the various team and its formation and the players are in it. What is it's weakness and what are its strength so that it will be easy for you to predict the result and you have a slight idea about who is going to win the match? We are also providing the various ways from where you can book your tickets online. Here you can get the information about every team of Bangladesh Premier League. But in this article, you will have the information about the Khulna Titans. We are here providing you the information relating to each team who are playing in the Bangladesh Premier League. Now the champion league has stopped for some reasons otherwise the teams from this league also get selected to play the champions league. Mahmudullah Riyad: A Right-handed all-rounder batsman of the team with the Right-arm off break bowling style. A very talented and experienced player for his both the teams. Kyle Abbott: A young Right-arm fast-medium bowler of the South African Team. He is a Right-handed batsman too. Benny Howell: A young t20 player of England. His batting style is Right-handed side and bowling style is Right-arm medium-fast. Dawid Malan: A left-handed Middle-order batsman and a Right arm leg break bowler. With not enough experience of international matches. Chadwick Walton: A Right-hand wicket-keeper batsman from West Indies with little experience of matches on the field. Sarfraz Ahmed: A Right-handed wicket-keeper batsman of the team. He is also a Right-arm off break bowler with enough experience of International cricket. Junaid Khan: A left-arm bowler with no batting experience. An experienced player who plays from Pakistan team. Shehan Jayasuriya: An all-rounder batsman of the team who is also a player of Srilanka. A Left-handed batsman with Right-arm offbreak bowling style. Named after the city Khulna, Khulna Division, Bangladesh. And it is one the former teams of BPL earlier this team is known as Khulna Royal Bengals. 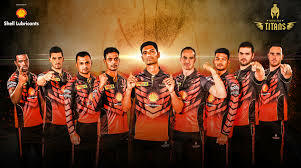 The team color is "Orange with Black Strips" and are unable to win any of the league of BPL. So guys bookmark our website for further related information and do share it with friends and cricket fans whom you want don't miss any update on this series. so guys that's all for this article visit our website for further information.